Gautam is a Director at Drewry Maritime Financial Research. Prior to Drewry, he was a Senior Vice President at DVB Bank, Senior Consultant at the Galway Group and Commercial Manager at Pacific Shipping. 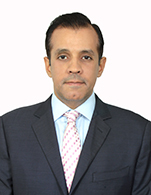 He spent a decade at DVB Bank where he held roles in the banks structured asset finance, M&A and leasing teams. He managed part of a team portfolio with US$2.4 Billion of maritime finance exposure. At the Galway Group, he advised several floating regasification LNG terminal sponsors on finance and operational aspects of their project execution. At Pacific Shipping, he managed a division involved in the personnel management of Offshore vessels, Bulk Carriers, Crude and Product Tankers for various large ship-owners. Gautam holds a degree in Economics from the University of Rochester, an MBA from INSEAD and is a CFA Charterholder.